Things look like they are finding an ending for this run in Harley’s story as she races to save Mason from Depertos clutches. Out of the Mayoral race and going out of her mind Harley gets her entire team tracking down Mason but she still manages to keep her cool when confronting Deperto, almost. Spoonsdale offers to help but Harley knows what it’s going to take to get Mason back and shes the only person that can do it. 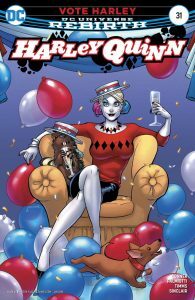 Harley shows her caring side this issue as she processes whats happening she has a heart to heart with Harley Sinn and a rather touchy Farewell with Poison ivy. Things don’t go quite to plan tho and Harley may struggle to deal with what she sees Deperto and Madison may struggle as well because if Harley catches up with them then they are in serious trouble! I know she has pulled out of the race but I’m still holding out hope for Mayor Quinn to take charge, would love to see how shed run the city! 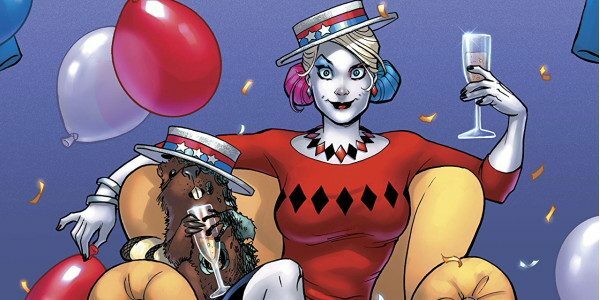 But there is a chance of seeing something better, an unleashed Harley full of rage and hellbent on revenge, either way, it will be one hell of an issue!